This paper deals with study and tests on an experimental car with the antilock-braking system (ABS) and vehicle speed estimation using fuzzy logic. Vehicle dynamics and braking systems are complex and behave strongly non-linear which causes difficulties in developing a classical controller for ABS. Fuzzy logic, however, facilitates such system designs and improves tuning abilities. The underlying control philosophy takes into consideration wheel acceleration as well as wheel slip in order to recognize blocking tendencies. The knowledge of the actual vehicle velocity is necessary to calculate wheel slips. This is done by means of a fuzzy estimator, which weighs the inputs of a longitudinal acceleration sensor and four wheel speed sensors. If lockup tendency is detected, magnetic valves are switched to reduce brake pressure. Performance evaluation is based both on computer simulations and an experimental car. To guarantee real-time ability (one control cycle takes seven milliseconds) and to relieve the electronic control unit (ECU), all fuzzy calculations are made by the fuzzy coprocessor SAE 81C99A. Measurements in the experimental car prove the functionality of this automotive fuzzy hardware system. Fuzzy Control, a relatively new, intelligent, knowledge-based control technique performs exceptionally well in nonlinear, complex and even in not mathematically describable systems. 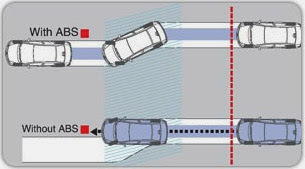 Thus the use of fuzzy logic for an antilock-braking system (ABS) seems to be promising.